Swimming, Hydrotherapy, Aquatic Exercise and more with H2X® Swim Spas! If you are a recreational swimmer, or someone who needs the buoyancy of water to avoid stress on your body, you can realize the benefits of an H2X Swim Spa. Say goodbye to stress, and hello to relaxation. H2X Xtreme Therapy Seats treat you to a massage that will renew your spirit. With an H2X Swim Spa, you can enjoy full-body benefits of aquatic exercise and therapy, conveniently in your backyard, year-round. Experience the ultimate backyard fun center! Optional high end stereo and LED lights create the perfect backyard oasis. Take a look at our swim spas. We're sure to have the model that is the perfect fit for you. 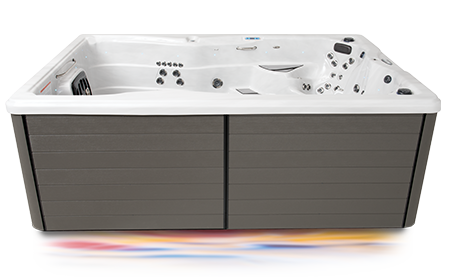 Take a look at the many features and premium options that are available on the H2X Swim Spas.